UPDATE: Here is a little filming update and what took place in the scene. Thanks to Ryan, who was lucky enough to work only a block away from the filming! Locke, in his wheelchair, comes rolling out of the building with a box of papers and office supplies on his lap. When he reaches his van, he sees the Hummer parked way too close, blocking his door and ramp. He starts to yell and gesture angrily, at one point throwing something. Then, Hurley — wearing jeans and a dress coat — arrives. Locke is still upset, but they talk. Then, Hurley pulls out a checkbook, writes out a check, and hands it to Locke. 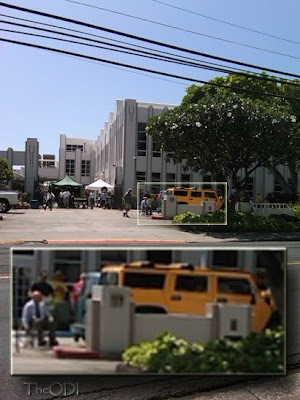 If you look closely at this new set pic for Episode 6×04 The Substitute you will notice Locke in a wheelchair behind what appears to be Hurley’s Hummer.